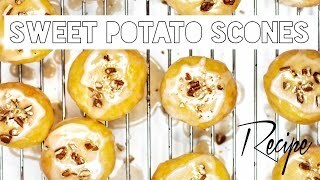 Yes, it is true – I have let you wait for this a little while, but my recipe video for the Vegan Sweet Potato Scones is now finally available on Youtube as well! 1. Cook and mash the sweet potatoes. 2. In a large bowl mix the flour with the salt and baking powder, then crumble in the butter and mix well to get a crumbly texture. 3. In a small saucepan heat the milk and add the vanilla extract and lemon juice. 4. Add the sweet potato mash to the flour mixture and stir well. Slowly add in the hot liquid. 5. Using a pastry blender, combine all ingredients well until you have a smooth, thick dough. Transfer onto a floured table top and knead for 5 minutes. 6. Roll out the dough about 2cm thick and cut out the scone shapes using a round cookie cutter. 7. Preheat the oven to 200C and line a baking tray with parchment. 8. Add the scones onto the parchment, leaving at least 2cm between them, so that they won’t stick together during the baking process. Brush the shapes with a little bit of soy milk. 9. Bake for 10 minutes until they are slightly starting to brown on the top. For even browning, turn the tray around halfway through the baking time. Transfer the scones to a cooling rack after. They are a perfect sweet but healthy snack for yourself and also children. Alternatively you can also top them with melted chocolate. If you are avoiding sugar at all, you can enjoy them without the glaze of course. Do you want to see more recipe videos? Then make sure to subscribe to my Youtube channel!